On “Today’s Homeowner,” we always say that small changes can make a big impact, and that certainly applies to one of the busiest rooms in the house: the bathroom. 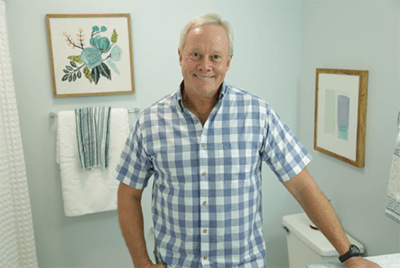 “Today’s Homeowner” host Danny Lipford shares tips to make a home’s bathroom more beautiful and functional. So what are some simple things you can do to make your bathroom beautiful and functional? Danze by Gerber’s Vaughn Faucet adds a sleek, elegant touch to homeowners David and Ally’s bathroom. And installing a Fluidmaster repair kit will completely transform their old toilet. That toilet will involve less mess thanks to Fluidmaster’s no-wax seal — and it will look great with a new Fluidmaster tank lever! Check out “Making Your Bathroom Beautiful and Functional” for more information.